Do you also have some videos with a big memory as Kenny? For instance, you have seen a wonderful 4GB movie and want to share it with your friends, or you would like to upload it to Facebook or other popular social websites. However, you will meet some problem when sharing and uploading the video due to the large size. Do you really want to share the whole movie rather than its highlight? Not really! So you actually need a smart video cutter to remove unwanted segments and cut them into several parts, which only keeps the important portion. In this article, we'll introduce the top 5 best free video trimmers used for the exclusive video splitting task. 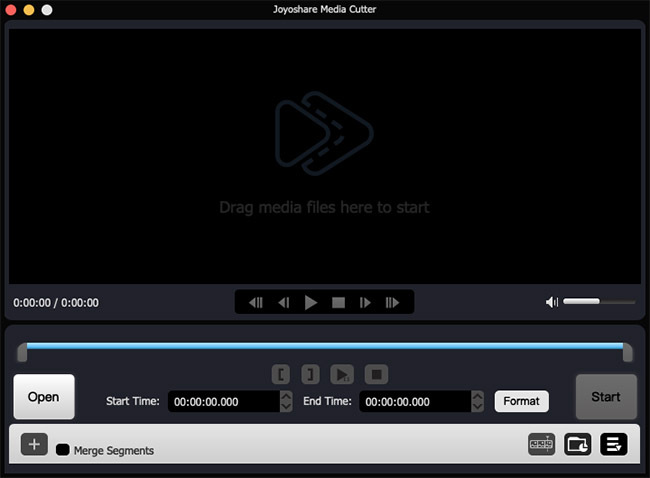 General speaking, Joyoshare Media Cutter is an easy-to-use yet professional video splitting tool. It aims to cut a large video and audio files to some smaller segments with lossless quality at a super faster speed. Joyoshare Video Cutter is also able to convert audio and video files to other popular formats, such as M4V, MP4, AVI, MPG, MPEG,3GP, MP3, M4A, AAC,AC3, etc. and merge multiple video and audio files from the same source by doing a few clicks only. With Joyoshare Video Cutter, you can use the sliders and timeline to enhance the accuracy of the video and audio segments that are being cut. With an easy interface, Avidemux Video Editor is a popular video cutting software, which makes it possible to cut and trim your big video files into smaller sizes with a good video quality. Besides, it is also designed for simple filtering and encoding tasks. Avidemux Video Editor supports most file types like AVI, DVD, compatible MPEG files, MP4, and ASF. It is available for Linux, BSD, Mac and Windows under the GNU GPL license. 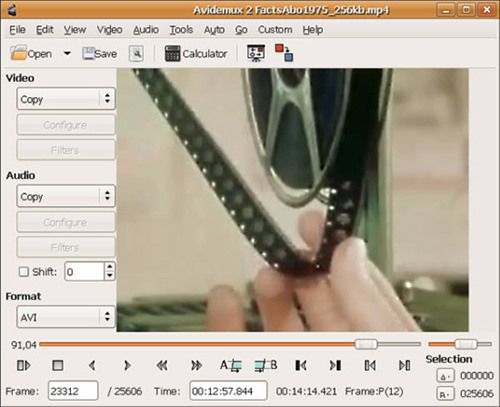 Avidemux Video Editor can also insert audio streams into a video file or extract audios from video files. Indeed, it is capable of transcoding videos into various formats. 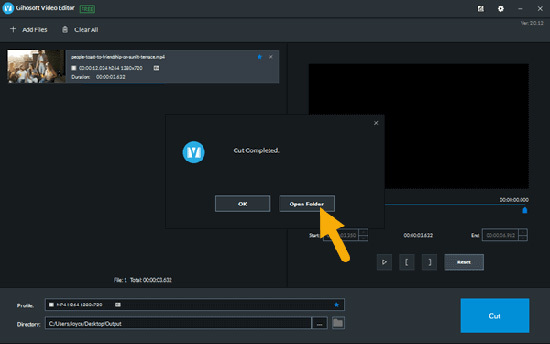 When you open the Gihosoft's Free Video Cutter, you can see a quick tutorial on how to use this simple video splitting tool. It also supports various formats: AVI, MPEG, VOB, RM, ASF, WMV, 3GP, MKV, FLV, MOV or MP4. You can improve the accuracy by controlling every second of the range for cutting. What's more, you should note that it has the only function that is cutting large video files. So if you just want to trim your unwanted videos, it might be a good choice. Cute Video Cutter is a functional video trimmer, which allows you to cut and split video segments of your favorite files into smaller sizes and remove unwanted footages according to your needs. Cute Video Cutter works well with many file formats like AVI, MPEG-1/2, DVD/SVCD/VCD, VOB, DAT, ASF, WMV, Divx, xVid, MOV, MP4, iPod, etc. Indeed, it also supports lossless compression and retains the best video quality. With built-in all encodec and decoders, you needn't install any other codec. In addition, it also supports batch conversion, which is convenient for you to convert all your files at once. 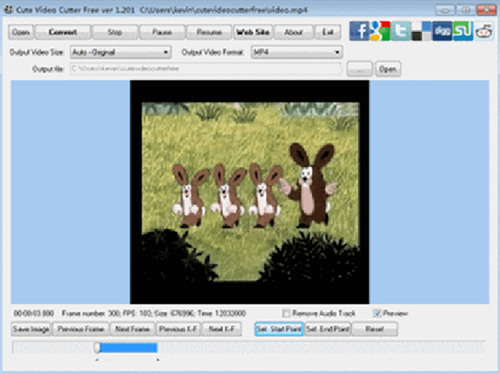 Weenysoft Free Video Cutter is a free video cutting software to trim a big video file to some smaller parts. With the help of this program, you can export the needed video files without trailer and commercial advertisement. 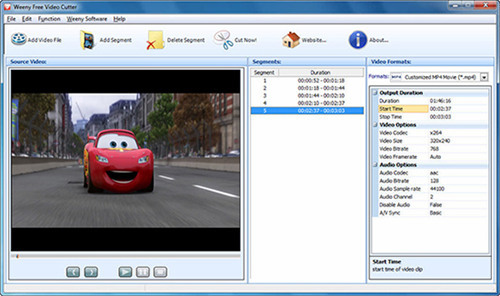 Weenysoft Free Video Cutter also provides the customization functions, that is to say, you can customize the output setting, such as video codec, sizes, bit rates and frame rates. If you want to make an exclusive video by yourself, you may need a functional video editor with more features besides video cutting, such as crop, adjust, effect, subtitle, watermarks, etc. Here I highly recommend the professional and powerful video editor - Joyoshare Video Converter, which enables you to convert all popular audio and video files to multiple output formats, including MP4, M4V, AVI, MOV, WMV, 3GP, etc. on both Mac and Windows OS. It works at 30X super fast speed with 100% original quality kept. Because of these amazing functions, you are allowed to edit and customize your own videos as your wish.